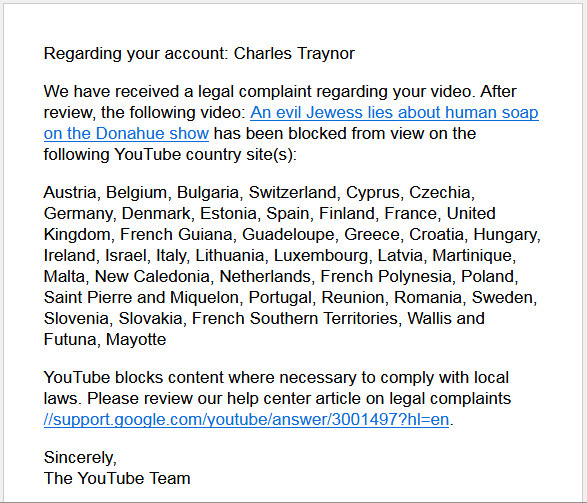 Members of the Jewish community have been busy flagging my YouTube videos again. 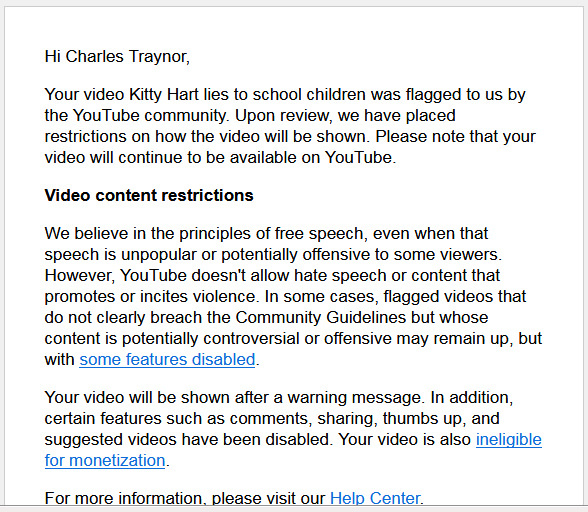 This time it was the turn of Kitty Hart lies to school children and Sturdy Colls Bought and Paid for by the Industry to feel the wrath of the censor. This censorship shows the Jews are desperate to protect their holocaust lie by keeping the truth about what really happened in the German concentration camps during WWII hidden from the masses. Contrary to what Google falsely claims about themselves, "hate speech" is perfectly acceptable provided it is the right kind of hate speech. Any kind of speech that criticizes Jews is subject to careful review and probable censorship. Speech that condemns the Germans and National-Socialists for crimes which, if fact, never occurred is entirely OK. Big difference! This claim is so true Freidrich. The revisionist YOU TUBE videos made which have nothing to do about hate but show a wonderful side to Germany and the Reich are censored or taken down. The very hateful videos that show the alleged Jewish suffering and gassing remain totally intact so that their detestation, lies and propaganda are now the only ones ever told. It seems that the people who control the media are the commony enemy of the truth, history and the people of the world: all of the people. Right on, Fritz and Trolljegeren. 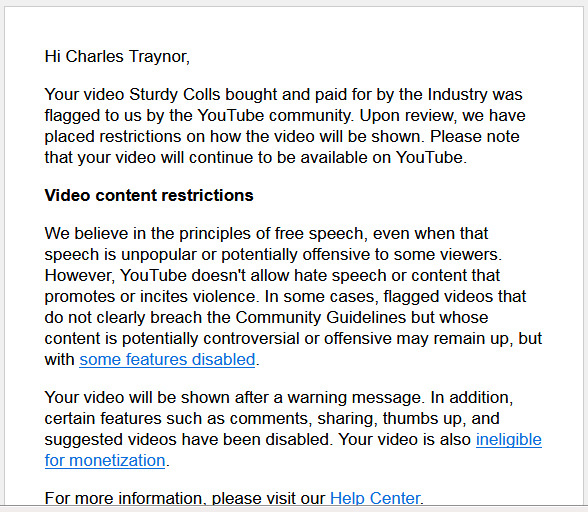 If YouTube still shows your videos, Charles, how is that censorship? StephenP, you are either very naive, stupid, or a True Believer attempting to mislead our readers as to the true extent of YouTube's blatant censorship. I suspect the later. The main victims of the holocaust are the German people closely followed by White people of European ancestry wherever they are found in the world. YouTube have banned my videos in Europe, this means hundreds of millions of people whose lives are directly affected by the Hoax cannot see or hear views which differ from the official 6M gassed narrative. In North America where free speech is protected by the First Amendment (but probably not for much longer if the Jewish community gets its way) the YouTube censors must tread a little more carefully. Here they force people to log into their YouTube accounts in order to watch my videos. The censors understand the majority of casual WWW surfers do not have the attention span required to go through the boring process of logging into Google. The censors win again. However, YouTube can still claim my videos are uncensored because millions of Chinese and Indonesians with absolutely no historical interest in the alleged Jewish holocaust have, for now, unlimited access to them. The main victims of the holocaust are the German people closely followed by White people of European ancestry wherever they are found in the world. Hhhhhhhhmmmm, are you sure that's right? Seems to me the victims of the Holocaust were Jews. Considering that occurred in Europe we are talking about European victims. Same with Poles and Russians, both suffered horribly under Nazi rule, along with the Greeks, Norwegians, French, Belgians, any country occupied by Germany during the war. YouTube have banned my videos in Europe, this means hundreds of millions of people whose lives are directly affected by the Hoax cannot see or hear views which differ from the official 6M gassed narrative. TBH, Charles, none of those people know who you are or give a crap about what your views are. And if you are trying to debunk some sort of "6M gassed narrative" congratulations, that's already been done for you by reputable historians. Frankly I can tell you that 6 M weren't gassed and I just started reading about the subject. Free Speech is a horribly misunderstood concept. Private companies can dictate what they allow on their platform, be it YouTube or Amazon. "Free speech" also doesn't protect someone from consequences like being fired for being obnoxious at work. For example, I can tell you that I think Donald Trump is a giant, orange, smelly douchebag. Now, I can't get arrested for saying that but if I screamed that in the middle of my workplace I can get fired for that. Buck up, Charles. No one is going to stop you from having your say here. Free Speech is a horribly misunderstood concept. With your attitude Jude the world may learn who the real Nazis are. Your attidude is disgusting. Well put NSDAP, I also find StephenP's blasé attitude towards censorship very disturbing. Unless of course he is a member of the tribe or one of their supporters in which case it is understandable. The Jew has been at the forefront of the campaign to censor the Internet for decades. Dr. Pierce understood the Jew and often spoke of their attempts to censor those critical of the holocaust narrative. Below are just a few examples of what he wrote on the topic. To me what's even more interesting about the "Holocaust" story than all of the holes in it is the motivation behind it, the way the story is being used today, and the response of various elements of our society to it. Let's go back for a moment to that deliberately misleading label of "Holocaust denier" that I mentioned earlier. If you've spent any time exploring the Internet -- especially some of the political discussion groups on the Internet -- you'll have heard that term "Holocaust denier" often enough. It's not that the "Holocaust" is a hot topic of discussion on the Internet. It isn't. But it is discussed occasionally, along with just about every other topic under the sun, and it's discussed openly, without fear. The Internet is just about the only place left where one can discuss politically sensitive topics openly. And that just drives the big Jewish censorship organizations crazy. They don't want any open discussion of the "Holocaust." They're terrified of it. The Simon Wiesenthal Center has been especially loud in its complaints about the lack of censorship on the Internet. Without censorship, they complain, the "Holocaust deniers" can say anything they want. If we don't censor the Internet, the "Holocaust deniers" can come right into your home and contaminate your child's mind while he's using his computer to do his homework. They've tried to intimidate people into silence. They'll have one of their own people claim to be a World War II veteran, and his standard line will be, "Hey, don't try to tell me there wasn't a Holocaust. I was there. I saw the bodies. So don't try to tell me there wasn't a Holocaust." Now, that sort of tactic may work on television, where they control the whole medium and no one can contradict them. But on the Internet people have been contradicting them. People have been saying, "Hey, we're not trying to tell you there were no bodies. We just want to know how many bodies. We want to know how they died." But they will not engage in a rational discussion with you. If one trick won't silence you, they'll try another. They'll say, "What difference does it matter how many? If only one Jew were killed just for being a Jew, that's a terrible crime. That's a Holocaust." That's supposed to embarrass you into shutting up. But on the Internet you can come back and say, "Well, what about the Germans who were killed just because they were Germans. What about the Russians and the Ukrainians and the Hungarians who were killed by some Jewish Commissar just because they were anti-Communists? Don't they count? Wasn't that a crime for which someone should be held accountable?" ...the Jews always stayed moderately well hidden behind the scenes. They kept a moderately low profile. I have a suspicion that they've gotten tired of having to keep their heads down. I think that they're itching to rule openly. That may account for the sudden huge increase in the number of Jews visibly involved in running the government, both in the United States and in Britain. I believe that it also accounts for the greatly accelerated drive to silence dissenters, to make any expression of Politically Incorrect ideas or any revelation of Politically Incorrect facts illegal. That's why there's a big push on by the forces of Political Correctness to censor the Internet, for example. That's why Blair has proposed making any questioning of the "Holocaust" or any unfavorable mention of Jews a crime. Believe me, the rabble will go for it. The people who voted for Clinton and those who voted for Blair will gladly sign away all their rights in return for the promise of a little more security. The problem with that is that they will sign away our rights too. What can we do about this terribly depressing and dangerous state of affairs? It is a current concern of the Jews that too many people are speaking out against them today, and too many people are listening, especially with the Internet not yet subject to Jewish censorship. The Jews' aim is first to demonize the people who don't like them and then to outlaw them, to cut them off from contact with the public, and to keep them from speaking out. In America they still are playing a double game, with some Jews pretending to be supporters of the First Amendment while other Jews are busy persuading the lemmings that the First Amendment ought to be abolished, but in every country where "speech crime" legislation has been enacted since the Second World War, the Jews are solidly in favor of that legislation and are the most active agitators for the prosecution of "speech criminals," the suppression of banned books, the rigid censorship of the Internet, and every other means to keep dissidents from challenging the Jews' control of the flow of information to the public. The same goes for the so-called "Holocaust." Any Jew can apparently make any claim without contradiction -- since anyone who disputes such claims is automatically attacked and called "anti-Semitic," "hatemonger," "Nazi," etc. Now that even the Jewish "holocaust historians" have recently lowered the death count from 6 million to 3 million (and some even much lower) that should be enough to open the whole thing up to honest historical examination, instead of continuing the old propaganda line. But no, the 6 million figure is still paraded around as gospel and few dare to point out the recent reductions by scholars. Actually, I think the Jews have put themselves in a precarious position by allowing these wild claims to go on virtually unchallenged. Although you may be surprised to hear that I don't deny that thousands of Jews were killed in WWII, I think that exaggerations are rampant. Keep in mind that some 50 million died in that tragedy. I find it offensive that the emphasis is almost entirely on the "6 million" to the exclusion of everybody else. There is a powerful form of censorship in this country. Look where the power and money leads and you'll find the source. When I was growing up we learned to value truth and to condemn hypocrisy. Nowadays we must bypass truth in order to be politically correct and to avoid offending certain groups. I say nobody should be intimidated out of investigating anything. This whole situation rubs me the wrong way and I'll never get used to it. I don't think that any society that accepts blatant lies and suppression of facts in place of the truth can survive. We must tell the truth no matter who doesn't like it. The demands for censoring the Internet first came from Jewish groups. The Simon Wiesenthal Center, headquartered in Los Angeles, has been foremost in screaming for laws against free speech on the Internet. The head rabbi at the Wiesenthal Center, Rabbi Abraham Cooper, has sent threatening letters to Internet access providers, trying to pressure them into denying access to any Politically Incorrect person. Rabbi Cooper doesn't say "Politically Incorrect." Instead he uses the buzzwords "hate," "hate speech," "hate crime." But what he means is "Politically Incorrect." And other powerful Jewish groups -- the Anti- Defamation League of B'nai B'rith and the Southern Poverty Law Center, for example -- mean the same thing when they talk about "hate." To them "hate" is anything which threatens powerful Jewish interests; "hate" is anything which they fear. And they fear nothing more than the truth. They fear nothing more than the exposure of their own motives and activities. They fear nothing more than free people armed with the truth about what these groups are up to. They know that they can only continue increasing their wealth and power at the expense of everyone else if they can control our thinking.